From BEIJING, Dec. 29 (Xinhuanet) — A national memorial service has been held for the DPRK’s late leader Kim Jong Il in Pyongyang. This is the final day of the country’s official mourning period. 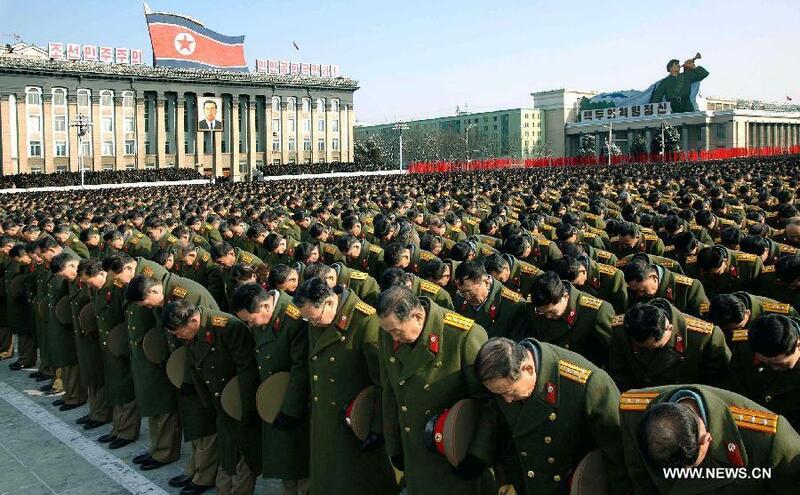 A sea of people attended the service, taking the last chance to pay respects to the late DPRK leader. During speeches to the crowds, top officials said Kim Jong Un, now the supreme leader of the DPRK will carry on his father’s legacy. A three minute silence was also held, and was followed by all trains, ships and other vehicles sounding their sirens in unison. This is the last day of the official mourning period for Kim Jong-il. On Wednesday, a three hour funeral procession took place amid falling snow in Pyongyang. Local newscasters described the weather as “heaven’s tears”. State television showed people weeping and wailing as the funeral cortege passed. Kim Jong Un was the head mourner on Wednesday, walking with one hand on the hearse for the first part of the journey. Kim Jong Il was the supreme leader of the country from 1994 to 2011. His body will rest permanently in the Kumsusan Memorial Palace.